Mechanical engineering is the broadest of the engineering professions. Because of the breadth of the ME discipline, mechanical engineers work in a wide variety of technical areas and are employed in a range of job functions. Specialty areas within the mechanical engineering discipline include, among many others, acoustics, biomechanics, CAD, controls, energy conversion and energy management, HVAC, materials, mechanical design, mechatronics, nuclear engineering, robotics and automation, and turbomachinery. The actual job functions which mechanical engineers perform vary widely as well. ME's work in design, research and development, manufacturing, service and maintenance, as well as technical sales, in almost every industry. Many are in management and administration. Many mechanical engineering graduates go on to more advanced degrees, or continue their education in other fields, such a law or business. Because of the wide diversity of specialties and job functions any two mechanical engineers might have significantly different day-to-day activities and responsibilities. Some may be concerned with very large engineering systems while others are working with small and even microscale devices and components; some work might call for highly analytical or mathematical approaches while other work might be more amenable to experimental or empirical approaches. Mechanical engineers may be involved in the operation of processing plants, or the design of engines, prosthetic devices, steam and gas turbines or compressors and pumps, alternative fuel devices, and many other devices and systems. 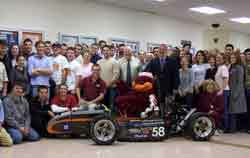 At Virginia Tech there is a close association between the ME departments research and design project activities with industry. This enhances the opportunities for student interaction with industry representatives. fundamental technical knowledge and skills in mathematics, science, and engineering to recognize, analyze and solve problems, and to apply these abilities to the generation of new knowledge, ideas or products in industry or government; and to implement these solutions in practice. practical experience to work well in local and international team environments and to become effective written and oral communicators, both for communicating ideas to other people, mentoring, and for learning from others. recognition of the importance of and engagement in life-long learning, whether through self-study, continuing education courses or workshops, or through formal graduate level education, and encourage others to have this same motivation. understanding of ethical responsibility and service toward their peers, employers, and society and follow these precepts in their daily lives. The Department of Mechanical Engineering at Virginia Tech is accredited by the Engineering Accreditation Commission of ABET, 111 Market Place, Suite 1050, Baltimore, MD 21202-4012, telephone: (410) 347-7700. One important objective of the Department of Mechanical Engineering is to ensure that every mechanical engineering graduate has the knowledge, ability, and understanding required to meet the basic ABET guidelines. The structure and sequence of courses is designed to provide these requirements for every graduate. The department is committed to providing students with an exceptional experience in both the theory and practice of mechanical engineering. In the senior capstone sequence, students are required to apply classroom knowledge to complex engineering problems requiring teamwork, problem formulation, economic analysis, effective communication, and product realization. These projects are carefully selected and updated to ensure relevancy to contemporary technical issues and needs. The department encourages the involvement of underclass students and students outside the department and college in these projects. The department also encourages hands-on student involvement by providing dedicated machine and welding shops that exclusively serve the undergraduate program. The required sophomore-level Manufacturing Processes Laboratory course and certification by a professional machinist are required prior to use of either of these shops. Opportunity for professional development is provided by participation in student professional organizations, such as the American Society of Mechanical Engineers, ASME, and the American Nuclear Society, ANS. A total of 130 semester credits are required for graduation. The curriculum provides a strong foundation in the basic physical and chemical sciences and in mathematics. These are followed by a sequence of courses that provide a broad background in design methodology, computer programming, electronics, solid and fluid mechanics, manufacturing processes, system modeling, machine design, thermodynamics, heat and mass transfer, statistics and materials. Courses in English and in the humanities and social sciences are included to broaden the individual. This background is strengthened and unified through a sequence of engineering design and laboratory courses. Instructional laboratories in the junior and senior years provide opportunities for students to learn measurement and instrumentation techniques. Students apply these skills to the acquisition and analysis of data from various engineering systems. In all professional endeavors the mechanical engineer must consider ecological effects as well as the economic and social needs of people. The mechanical engineer must consider the conservation of natural resources and the environmental impact in the design of systems. These considerations are included in a number of ME courses and technical elective classes. Students wishing to further strengthen this area may wish to consider the Green Engineering Option at http://www.eng.vt.edu/green/index.php. The unifying activity in all aspects of mechanical engineering is the design function. A special emphasis has been placed on the use of computer-aided design methods and applied design project experience as a required part of the curriculum. Elective courses in the junior and senior years provide students with the opportunity to pursue specialized interests related to career plans or preparation for graduate study. The department participates in the Cooperative Education Program in which qualified students may alternate semesters of study with semesters of professional employment. Approximately twenty-five percent of all mechanical engineering students participate in this program. To prepare its students to function as true global engineers, the department offers in collaboration with its sister department at the Technische Universität Darmstadt, Germany, the students the opportunity to complete their senior year at the other university and thus earn a BSME degree simultaneously from both univerisities. The Department of Mechanical Engineering actively seeks input on the nature and quality of our program from all interested individuals and organizations, including students, employers and supporting agencies. Our goal is to provide the best possible service to the students who entrust their education to us. Through our continuous improvement efforts, we pledge to continually improve the content of our curriculum, our educational methods and our facilities. Comments to the department head or any member of the faculty are welcomed. Note that, because of this continuous improvement process, degree requirements and course content are subject to periodic change. Please consult the department academic advisor for current information. Mechanical Engineering is a restricted major. Students must have a 2.5 or better GPA and complete the required freshman year college of engineering courses to gain admission. University policy requires that students who are making satisfactory progress toward a degree meet minimum criteria toward the Curriculum for Liberal Education (see Academics chapter in this catalog), and toward the degree in mechanical engineering. An in-major GPA of at least a 2.0 (includes all courses with a « ME » prefix in the course number). The department offers graduate programs leading to the M.S., M.Eng., and Ph.D. in mechanical engineering (see the Graduate Catalog). MATH 2224, 2214: Multivar. Calculus, Diff. Eq. There are no hidden prerequisites. Foreign Language Requirement: Students who did not complete 2 units of a foreign language in high school must earn 6 credit hours of college level foreign language. These credits are in addition to those normally taken for graduation. The German language courses are only required for those students that do not possess sufficient German language skills: The lectures and exams at Technische Universität Darmstadt (TUD) are in German. The Bachelor Thesis may be written in English. The students must pass the UNIcert Level III exam at TUD in order to enroll in TUD engineering courses. GER 1114 is equivalent to GER 1105-1106 and satisfies the VT foreign language requirement. GER 2114 is equivalent to GER 2105-2106 and counts in this context as technical elective (2credit hours) and free elective (3 credit hours). Students must earn a B+ or better in GER 2106 or 2114 to continue at TUD. Students that do not take GER 2105, 2106, 2114, or at least 4 CP ECTS German language courses at TUD as a VT technical elective will need to complete an additional 2 credit hours of technical electives. TUD requires at least 60 CP ECTS be completed at TUD. The VT BSME degree program requires at least 130 semester credits for graduation. The VT BSME degree program requires at least 130 semester credits for graduation. Design process, mini-design projects, collaborative design, product dissection, economics of decision making, reverse engineering, intellectual property, oral, written, and graphic communications, engineering ethics. Pre: ENGE 1016 or ENGE 1114. Co: ESM 2104, PHYS 2306. (3H,3C) I,II. Basics of thermodynamics, fluid mechanics, and heat transfer. Fluid and thermal properties of materials. Ideal gas equation of state. First law of thermodynamics in closed systems. Transient heat transfer. First law of thermodynamics in open systems. Fluid mechanics balances, open systems. Emphasis on applications in all topic areas. Pre: ESM 2104. Co: MATH 2214. (2H,2C) I,II,III. General treatment of the basic laws of thermodynamics with emphasis on engineering applications. This course is for curricula not requiring 3124. Classical thermodynamics and its applications. Thermodynamic properties of pure substances: property tables, property software, equations of state. First law of thermodynamics. Second law of thermodynamics. Gas mixtures. Combustion: atom and energy balances. Power and refrigeration cycles. Pre: 2124, (MATH 2214 or MATH 2214H). (3H,3C) I,II. Comprehensive basic course in heat and mass transfer for mechanical engineering students. Principles of conduction, convection, and radiation with applications to heat exchangers and other engineering systems. Pre: 2124, (MATH 2214 or MATH 2214H). (3H,3C) II,IV. Comprehensive first course in basic and applied fluid mechanics. Fluid properties, statics, kinematics, and dynamics. Euler's and Bernoulli's equations. Hydrodynamics. Dimensional analysis and similitude. Real fluids, laminar and turbulent flows. Boundary layer model and approximate analysis. Compressible flow and propulsion devices. Flow measurement. Introduction to turbomachinery with applications. Pre: 2124, (MATH 2214 or MATH 2214H). (3H,3C) I,II. Principles of dynamic system modeling with emphasis on second order mechanical systems. Harmonic and nonharmonic vibrations of single and multi-degree of freedom systems. Applications of computer simulation and analysis techniques in vibrations. Pre: (MATH 2214 or MATH 2214H), ME 3514. (3H,3C) II,III. Mathematical descriptions of physical systems' behavior including mechanical, electrical, thermal, and fluid systems and their combinations; system descriptions using state variable and transfer functions; analysis of system responses: convolution integral, frequency response, numerical simulations, and Laplace transform methods; systems concepts: input-output, causality, and analogies; general process descriptions including first-order, second-order, and time delayed. Pre: ESM 2304. (3H,3C) I,II. Design of mechanical components subject to static and fatigue loads. Design using screws, fasteners, springs and bearings. Computer-aided design using transfer matrix and finite element methods. Pre: ESM 2204, (MATH 2214 or MATH 2214H). (3H,3C) I,II. Fundamentals of feedback control theory, classical analysis and design techniques for automatic controls, introduction to modern control theory. Participants will study topics fundamental to rapid prototyping and automated fabrication, including the generation of suitable CAD models, current rapid prototyping fabrication technologies, their underlying material science, the use of secondary processing, and the impact of these technologies on society. The rapid prototyping process will be illustrated by the actual design and fabrication of a part. Programming skills required.